The client application allows to use INS as Client-Server Fax Server, to which several clients can submit their faxes. At the same time it provides a simple message sending interface. Faxes are created through the INS Fax Printer. By simply printing to this driver from any Windows application, a Fax file is created. You can then submit this Fax to be sent by Message Service. As both applications MsgService.exe and INSClient.exe try to connect to the MAW Fax printer, they can not run both on the same machine. Do not install INSClient.exe locally on a client computer. To install the INSClient on computer clients, there is a small installation utility under c:\ins\clientsetup. This does not install the INSClient.exe on the local computer (only the DLL files) and creates a link to the mapped server version of INSClient.exe. Just share the server directory where INS is installed (c:\ins) as read/write and map a network drive (EG S:\) from the client computer to this share. Then enter this path during the installation of INSClient when asked. Replace the IP address 192.168.1.9 with the IP address of your server and \INS with the name of the share you have created to be mapped from the clients. When you start the INSClient.exe application you will see a small icon on the taskbar . The Outbox displays the currently submitted messages. Once a message has been sent by Message Server it disappears from this list and becomes visible in the Sent of Failed log. Through the Install Fax Driver on this Server button you can add a new virtual printer, to which you can print your faxes from any windows application. 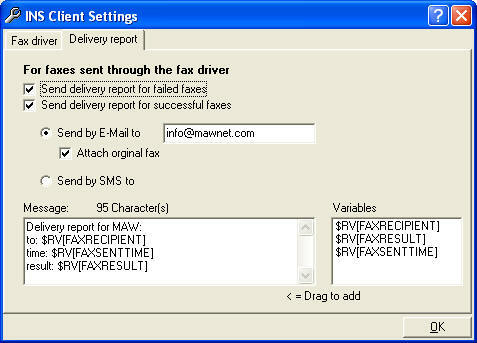 The Delivery report option will allow you to be notified after the successful or failed sending of a submitted fax. It is submitted as soon as the fax has been successfully sent, or is not retried anymore and stored in the failed folder. To create the delivery notification message you may write your own text and also use the dynamic variables on the right. If you choose to send the delivery notification by e-mail, you may select to receive a copy of the fax as attachment. If you choose to send the delivery notification by SMS, the message length should be less than 160 characters (or 140 if sending through a GSM device). The values entered here are stored locally in the registry of the computer. Leaves the application INSClient. Faxes printed to the MAW Fax printer will not be sent anymore.